Leader of the Italian National Fascist Party, Benito Mussolini, became Prime Minister in 1922. On this date in 1925, he dissolved the Italian parliament and declared himself dictator. He gave himself the name, "Il Duce." Mussolini continued to run Italy until the war in Europe was winding down and he was executed by firing squad on April 28, 1945. The following quote sums up his view of humanity, "War is the normal state of the people." 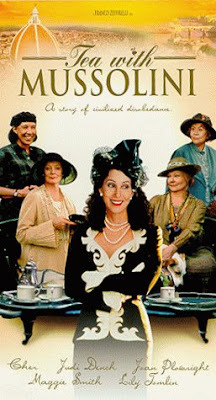 It might be interesting to view two DVDs in our collection Benito: The Rise and Fall of Benito Mussolini [DVD BEN] a fictionalized version of his life, and Tea with Mussolini [DVD TEA] a look at the dissolution of normalcy in Italy during the period leading up to WW II. It is based loosely on director Franco Zeffirelli's autobiography. It is a comedy, but with dark undertones.